With my Cleaner Seas Project hat on and with a keen interest in recycling/waste management and having previously worked in Brands packaging, one of the issues that I deal with for the Cleaner Seas Project and lately A Greener Bude is biodegradables/compostables. There is much confusion about biodegradables at a time when small to large businesses and consumers are looking for a sustainable, viable alternative to plastic. There is potential in our desperation to find these solutions that we opt for alternatives that we believe to be better for our environment, when in actual fact we know little about them or how they will be recovered. Could we be, in our attempts to find an alternative to oil based plastics, adding to the confusion and pollution? Currently companies selling their products in biodegradable packaging can claim that their products are "compostable" or home compostable even though there is no existing standard for this. Many products that are listed as "home compostable" or "compostable" must be recovered via industrial composting or the plant based polymer it is made from could exist in our environment for a long time. Snact claim that their products are home compostable. Crisp packets (Walkers Crisps alone produce 10,000,000 a day) are non recyclable so to be told a company offer a solution with fully home compostable snack packets is music to my ears. After a little searching and questioning I am told by Snact that their products are made from a plant based polymer. After further questioning I am told it is fully home compostable. This is contrary to what I currently know about plant based polymers. Snact Claim on their website that their products are indeed fully home compostable. 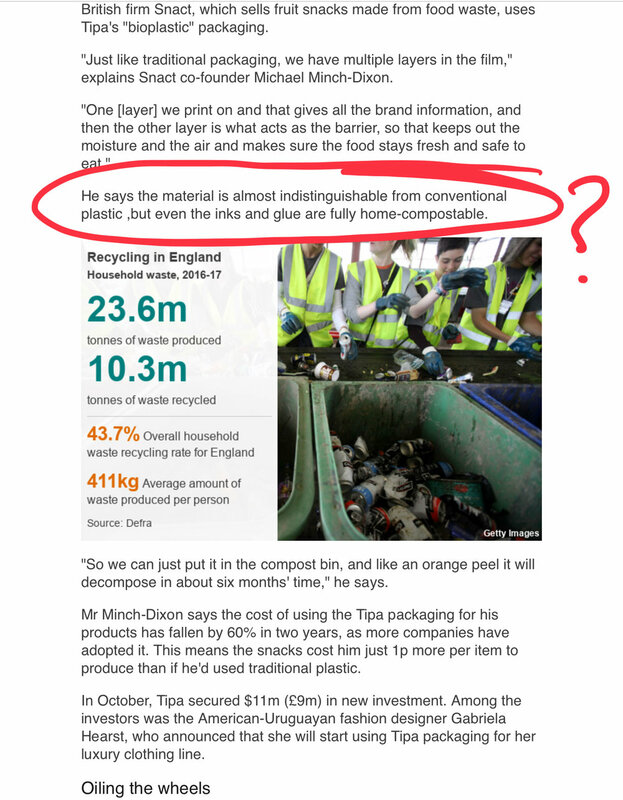 BBC online news has applauded Snact for this remarkable packaging that looks like plastic but is fully home compostable. Please note that I have used Snact as an example because we have recently connected on Twitter, but there are many companies providing plant based polymers as an alternative to oil based plastics. Tipa products are compounds and films that comply with EU 13432 (shown above) and ASTM D6400 standards and are certified for both home and industrial composting through the OK Compost mark by the Vincotte Institute. Tipa describe Snact packets as Certified as compostable in industrial conditions EN13432 on their website. Snact do acknowledge on their website that industrial composting facilities where temperatures are approximately 50 to 60°C differ from that of home composting which has lower temperatures and is less constant than an industrial composter and so is usually more difficult and slower paced. They suggest that it will take 6 months to compost in a home composter. I've asked them for some scientific proof to back this up. However there are other questions I have... depending on how many snack packets you might use per week, what size composter would one consumer need to compost these packs effectively? Also how many consumers know how to compost correctly and effectively anyway? What percentage of the UK population have access to a composter and are able to compost at their home? That's not to say this is impossible, but It appears to me that we do not have an infrastructure currently that can deal with this. It is imperative at a time where there is already massive consumer confusion about what can be and what cannot be recycled we are clear about what packaging is made from and how we recover it. Clear labelling and alongside that clear defined legislation and strict standards are needed. We are, with plant based polymers adding another stream to the already failing UK waste management system. For biodegradable to be a better option than recyclables we must be able to recover it correctly. It is essential that there is an infrastructure in place to deal with this. Currently there is not. We need better legislation and standards to cover biodegradable and compostables urgently. Clear labelling on products about what the packaging is made from and how it should be recovered. It is my belief that if we do not put legislation, standards, infrastructure and clear labelling in place now, "biodegradable plastics" have the potential to have a massive negative impact on our already suffocating environment. Biodegradables continue to encourage a disposable thought process and consumers may wrongly believe their "compostable" packaging will disappear when they drop it on the ground, in the ocean or send it to landfill. This is the belief of most people I have spoken to about it. This in turn relieves consumers of responsibility of what happens to packaging once it has left their hands. In addition to this biodegradable plastic will contaminate an oil based plastic recycling stream. It is incredibly hard to find information on this subject and I made the decision to write about it in the hope that individuals, businesses and organisations will get in touch and add to my thoughts. Waste management is currently complex and I implore the Government, big brands, product and packaging designers, scientists and waste facilities to put their heads together and use some joined up thinking. Let's connect those dots. Let's do it now. The Ban List (link below) has provided some much needed evidence about how biodegradable plastics behave in the environment and back up my concerns. Please do get in touch if you have something to add to this article. We're all on a journey to find better solutions and I would be very interested to hear what you have to say. I do not claim to be an expert on this subject but fear the consequences of businesses keen to be a part of the solution to the plastics problem are inadvertently adding to it. If we don't ask the questions we won't find the answers. Ei8ht Design was approached to re-brand Vicky Barnes Holistic Treatments and Therapies. The existing flower element was the only equity that was to be kept in the new design. After initial consultations and idea generation, we established a strong brand colour, a simple design used alongside beautiful photography of Vicky's treatments, as well as stunning Spiezia product shots. Photography of Vicky and her Client by Clive Symm, art direction by me. The Vicky Barnes Holistic Therapist identity has been applied across all signage, stationary, website and social media platforms, conveying a clear, consistent and strong brand message across all channels. "Avril at Ei8ht Design is so much more than a graphic designer, she's everything a small business like myself needs to get started. From branding to signage and stationary Avril was fantastic! she really did her research into my industry and provided me with a timeless graphic that really reflects me and the service I offer. I was and am still very happy. Avril 's in-depth knowledge of marketing and social media was invaluable in getting me seen both on the Web and locally. She is one very versatile and talented designer. I would highly recommend her to anyone looking for re-branding or for social media advice. She also takes a great photo! A very satsfied customer". So I was very excited when asked by Ian Saltern to undertake work for The Cleaner Seas Project, a national pilot project being delivered in Bude by Volunteer Cornwall on behalf of the Environment Agency. The project aims are to ensure that bathing water quality reaches, or exceeds, the new 2015 required standards. The branding I created for the project is clean, clear and contemporary with an abstract image representing rivers and oceans. The imagery and message is consistent and runs across the Cleaner Seas Project print and content across all channels. It was an incredibly happy moment to see the Cleaner Seas Project flag flying on the flagpole on The Breakwater on Summerleaze Beach, Bude, Izzy's sail and the editorial in Cornwall Today. One of the aims was to convey the Project's message to the local and wider community. Multiple channels were used to do this, Facebook, Twitter, print, flags, banners, board stickers, beach cleans, magazine editorial and a shareable video. We were delighted that Team GB windsurfer Izzy Hamilton and local up-and-coming grom Kit Innes agreed to be involved too. Both gave their time and voice to the Bude Cleaner Seas Project video and many thanks to Izzy and Team GB for supporting the Cleaner Seas Project by displaying the logo on Izzy's sail. Congratulations to Ian Saltern, Volunteer Cornwall & The Environment Agency for heading up such a forward looking project. It's been amazing to see Summerleaze and Crooklets achieve 2015 Seaside Awards and Widemouth a blue flag, all seeds which were planted by Ian and the team behind The Cleaner Seas Project. A massive thank you to Ian for asking me to be involved and for this very kind testimonial. ”Avril was contracted to the Bude Cleaner Seas Project in May 2013 to undertake social media, design and promotional work. I selected Avril because of her strong local knowledge and her well established network of contacts in the voluntary and commercial sector. When I first saw these black and white images by Baptiste Debombourg I was immediately drawn to them. I really loved the Renaissance style mural in shades of grey on the expanse of white wall, with the simple yet dramatic backdrop of the warehouse. The use of scale is effective and I love the way the artist hasn’t contained the image with the frame of the wall and floor, but instead let the bodies escape the canvas. 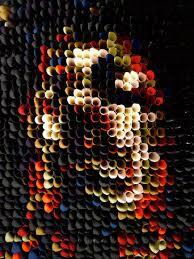 Incredible then that these images are actually created using staples (450,000 apparently in this particular one). Breathtaking. I can’t remember the last time I wanted to see an artwork as much as I do this one …. until I saw the shots of Aerial also by Baptiste Debombourg.Using waves of shattered laminate glass against the backdrop of Brauweiler Abbey in Germany. The installation gives the effect of waves of water smashing in through the large windows. There is greater meaning, the Abbey has had many uses, amongst them a beggar’s Institute, a concentration camp, a Gestapo prison and a mental hospital, Debombourg playing with transformation/change. The light flooding through the windows and shining through the glass referencing the original, spiritual use of the Abbey. Even without the references and deeper meaning, it works for me, juxtaposed with the architecture of the Abbey, it is simply stunning. This is not the sort of artwork you want to be looking at for too long when you are on a self imposed low GI diet… but this is so beautiful I could not resist. Thin layers of chocolate are slowly removed from a cylindrical block of chocolate to reveal layer upon layer of geometrical patterns. The Chocolate Mill by Wieki Somers at the Vitra Design Museum, and helped by Swiss chocolatier Rafael Mutter, was adapted from a cheese cutter. The laborious process reveals many beautiful layers and the length of this process maybe also reflects the length of time it takes to mill really good chocolate… time is not an issue here. Little chocolate mills are on sale in the Vitra Shop, including special chocolate for refilling. My hat is firmly tipped in the direction of the wonderful Bude for Food crew, what an incredible first festival! The sun shone, the chefs and local artisan food producers did their thing and the foodies and the party goers of the south west rocked up. Late Sunday afternoon the Marquee doors closed on Bude for Food 2014 leaving the festival foodies to trek home with full tums, bags full of delicious treats, and a warm fuzzy feeling, and the crew with the task of packing it all away. A mahoosive round of mighty cheers to everybody who made it happen, it really was a wonderful weekend, you’ve set yourself a very high bench mark for 2015. Ever since I was old enough to hold a colour crayon in my fingers I have loved to draw and create. It’s never been a particular choice, more something that is a part of me. I love that 100 different people given just a pencil and paper could each create an artwork, common in it’s medium but that is totally unique. I was reminded of this recently, when I received a surprise parcel from Arjo Wiggins, … I was the winner of one of three signed prints by Ian Wright, as part of a creative collaboration between Wright, design agency Blast and Keaykolour Paper. The Print is of an artwork made using Keaykolour paper rolled into cones to create a 3d portrait of Hendrix, a common theme for Wright, whose work has been inspired by music and has been a contributor for the NME .. it’s fab and I feel incredibly lucky to have received one of the signed prints. It’s a clever piece of marketing. The Exhibition by Wright showcased Keaykolour Paper, in a innovative way. Wright’s collaboration with Keaykolour is an impressive endorsement, giving credibility. The idea has “legs”, …. the exhibition, the prints, the competition to win the prints, youtube videos capturing the art in progress, lucky designer who won a print blogging about it, and hence effectively utilising social media. The film itself (above) shows Ian Wright talking about his work, and the creative process, using paper not as something to draw on but as a material, and how music has inspired his work.